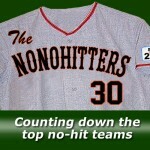 Coming in at #26 on our NoNoHitters 30 countdown is the The Toronto Blue Jays, a team that joined the American League in 1977 as an expansion franchise. Dave Stieb’s no-no ball in the Hall of Fame. The Blue Jays have just one no-hitter over the club’s 37-year history. Dave Stieb, the king of late-inning near-misses, finally got his no-no (and the Blue Jays’ first) during the 1990 season on the road against the Cleveland Indians. On August 8, 2010, Brandon Morrow came within one out of throwing the Jays’ second no-hitter, but the Tampa Bay Rays’ Evan Longoria tagged him for a two-out, ninth-inning single.